Well, that was sooner than I expected. Time for some reactions before the books are even released! It appears that, aside from the new characters in the Carrion Empire starter box, each army is getting a battletome, a scenery piece, endless spells, and that's it. The Skaven release is about what I expected. New units were a long shot, but I'm satisfied with a book-only release. And it appears that the battletome is combining all the clans into a single army. Now the wait is to see how the unit warscrolls change, and if anything gets dropped from the army (or added). For a brief second, I had my hopes up that they might rework the warscroll for the chieftain with battle standard, but then I remembered that there's no model for it, so it won't be in the book. I had feared that older items like Rat Swarms might get dropped, but there are swarms in the lower right corner of this image, so they're probably still included. The old Skryre Acolytes are there too, but I don't see any Poisoned Wind Mortars. That's a bad sign, especially considering that the only place to get the mortars was the now-defunct Island of Blood starter set. 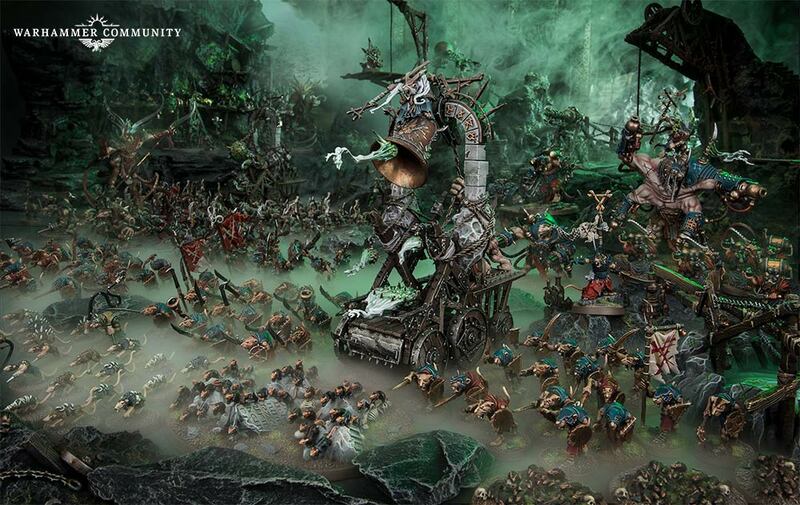 The Skaven scenery is neat, but it suffers from "I could make that" syndrome. I'm torn over whether I should buy the kit or just scratch build my own. 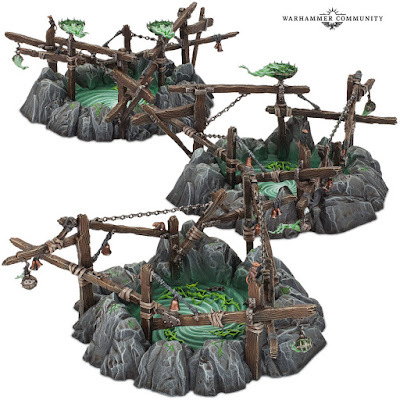 Some of the details like the braziers and bells look like they were just imported right off the Screaming Bell CAD file, which is a little disappointing from a uniqueness standpoint, but if this set isn't too expensive it could be a nice way to get extra parts to "Skaven up" the other scenery on your battlefield. It looks like the terrain set is made of three pieces, which is going to be a pain to drag around whenever I go play a game. I like the idea of army-themed scenery pieces –they ensure that no matter where you're playing and/or how sparse the store's collection of terrain might be, each player will have a cool-looking piece of scenery to put on the battlefield– but carrying a giant collection of scenery everywhere is a little cumbersome. It's like having to bring a display board for your army any time you go out to game, rather than just when you go to a major event. The endless spells are neat-- I really like the floating warpstone and the crackling bell. As I predicted, there is a "Vermintide" spell, but the amount of rats on the base is pretty underwhelming. The base should have been covered in swarming rats; I'll definitely be filling it out with my spare rats. GW have teased a few items from the battletome– There will be a lot of different allegiance abilities, magical artifacts, and two spell lists. I noticed there is a new keyword Skaventide, which will probably be used to include the different clan units under one heading. 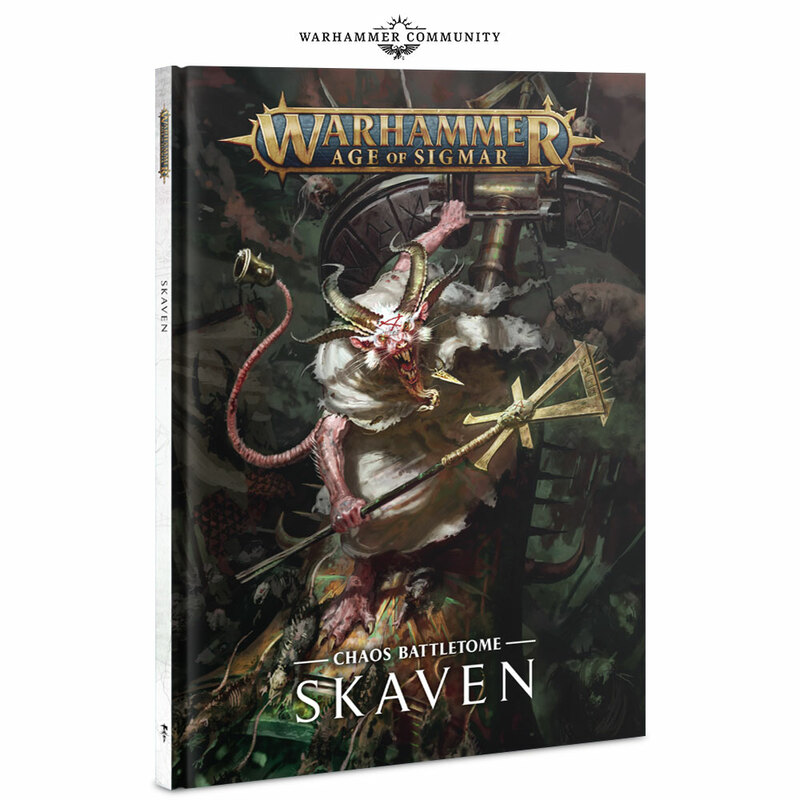 Overall, the Skaven release looks very promising. I'm excited to finally be able to field an entire Skaven army as a unified force, and consider my entire collection of models when constructing an army. I'm just holding by breath to see which units are dropped. I had begun writing this before GW posted their Flesh-eater Battletome preview, but today's Warhammer Community post seems to have confirmed my fears– It looks like they haven't added anything to the Flesh-eater Courts. None of the photos have any models other than the existing kits, which is a shame. The scenery piece is a little underwhelming. While I like the aesthetic of a throne of bones, it just feels out of place. It should be in the ruins of a castle or in the heart of a catacomb, but in many games this piece will just be plopped on the battlefield, in the middle of an open field. Narratively, it will appear as though the Ghoul King found a random ruined stairway and built a throne on it. I hope the rules for the throne specify that it needs to be set up in the army's deployment zone, because it really should be situated where the army has amassed, not halfway across the battlefield between them and the enemy force. The endless spells look great. The horses are some of the coolest looking models GW has ever produced, and it's a shame that they are a spell and not a regular unit, because that means I'll paint them, bring them to the battle, and then they'll just sit on the side as I wait to cast the spell, and maybe never make it into the game. The horses might also be great as alternate cavalry mounts, I could imagine two of these pulling a Corpse Cart. But at least one of them doesn't have any back legs, and their body halves might have components that are molded together making it difficult to separate into four fully-formed horses. I can't wait to see how the model sprue is broken down. I think I'd prefer the fence to be part of a scenery kit rather than a spell that pops up one random fence somewhere. If a Ghoul King is going to summon a barricade out of the earth, it should have been made of bones or look like a giant rib cage. That's a missed opportunity. Overall, I'm pretty disappointed in the Flesh-eater Courts release. If the battletome doesn't at least add in more of the existing and appropriate units like fell bats and bat swarms (even as allies) I think I'm going to pass on this one. Personally, I'd rather stick with the existing warscrolls and the allegiance abilities in the General's Handbook for another year and then get a fully fleshed-out army release. For me, the excitement comes from new models to build and play with, not new rules for the same old stuff, particularly when the same old stuff is already so limited. The Nighthaunt release did it right by creating an entire stand-alone faction, half of which could be included in a Legions of Nagash army. Since the beginning of Age of Sigmar, the Flesh-Eater Courts have been segregated out from the rest of the Death Grand Alliance, and it will be a shame if we get a new battletome only to have it remain that way. I keep seeing reference to 'Clawlords' as a hero slot, and wonder if this is their new version of the Chieftain. Yeah, it's probably a hero keyword for specific Skaven characters, maybe only the Verminous or Masterclan heroes. Something to distinguish them from others like the engineers and priests, the same way we have Deathlord, Vampire Lord, and Deathmage keywords to separate the Legion of Nagash characters and distinguish which artifacts, traits, and spell lores they can take. I'm managing to hold off from actually getting into AoS yet, but I kind of want to grab most of these just for Terrain and/or Conversion parts. I've got some other fantasy ruins that the Throne of Bone will go really nicely along with, and the Gnawholes will actually go pretty nicely with some of the Daemon World terrain I've managed so far. The fence could go well with either. And I can def find something cool to do with swirling columns of energy with lightning shooting out. Price-wise, the Faction-specific Terrain pieces so far have all been in the US$30-40 range, and the Endless Spell sets are all US$35. 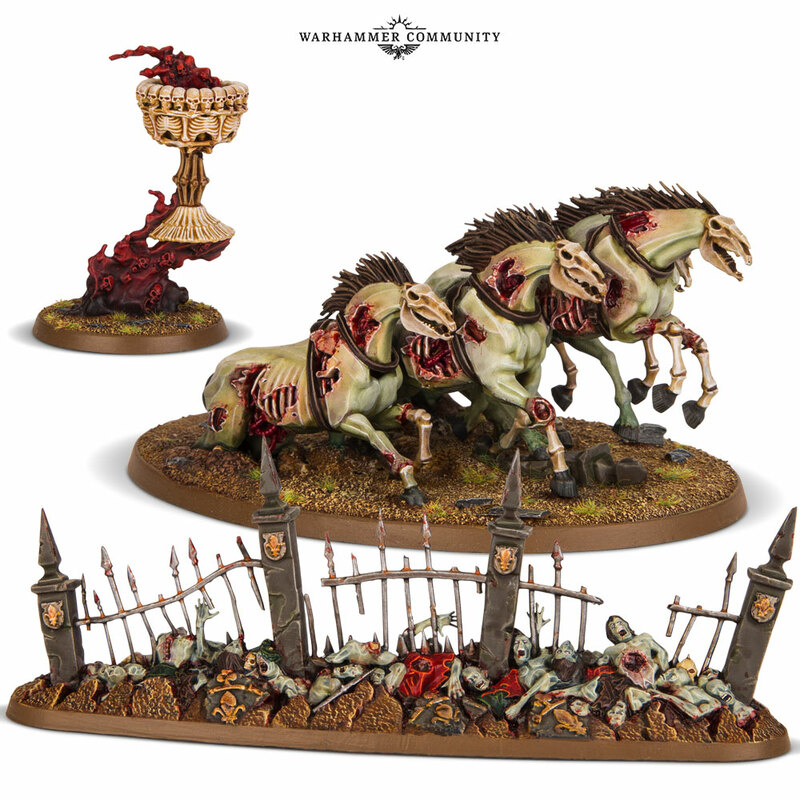 The disappearance of Plague Wind Mortars, rather than them getting new Models, would be a big disappointment to me, as is the lack of new kits for the Flesh-Eater Courts. GW's models always look great, no doubt. That giant Loonshrine is $60 US, which isn't bad for such a large kit. 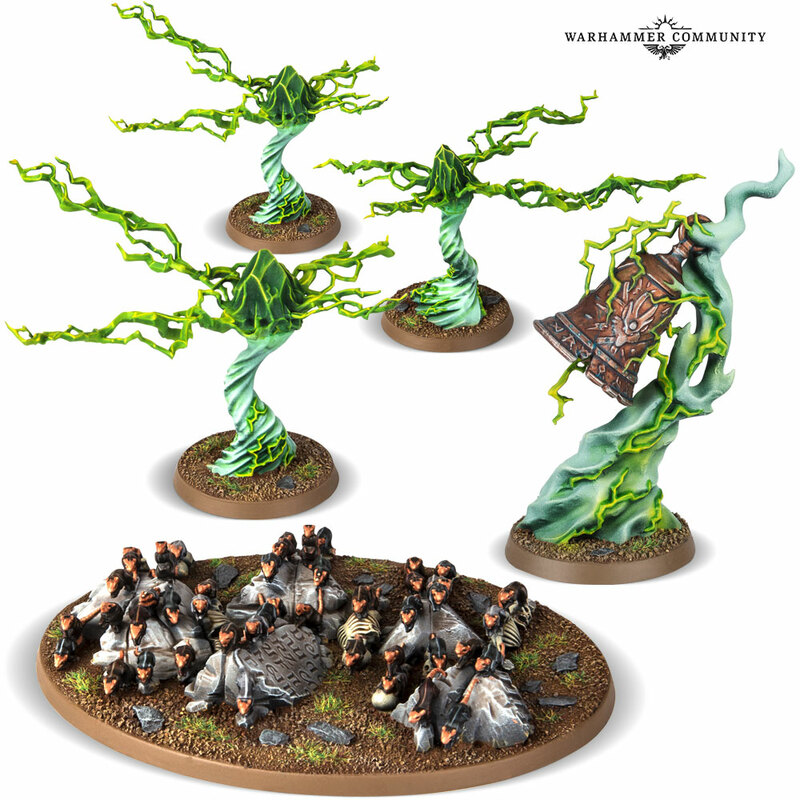 ONE Feculent Gnarlmaw is $30, so the Skaven scenery will probably fall right around $45. On the GW site, there's no warpfire thrower weapon team available for sale (not even the old metal/ resin kit), but there IS a warpfire thrower in the new art. It would be odd to omit the warpfire thrower warscroll, but show it in the art, not to mention that it would be a Skaven army without one of its signature units. So there's hope that they'll leave ALL the weapon teams intact, and maybe release new kits for those two models (or a multi-kit) somewhere down the line. I think the Zombies are officially the oldest plastic kit that GW still sells, and they could definitely use an update. I don't expect new zombies any time soon though, because the FEC spell with the fence looks like it has re-used assets from the corpse cart, and if they were sculpting new zombies, some of those probably would have made it into the CAD rendering of the endless spell fence. That sounds like an awesome conversion. 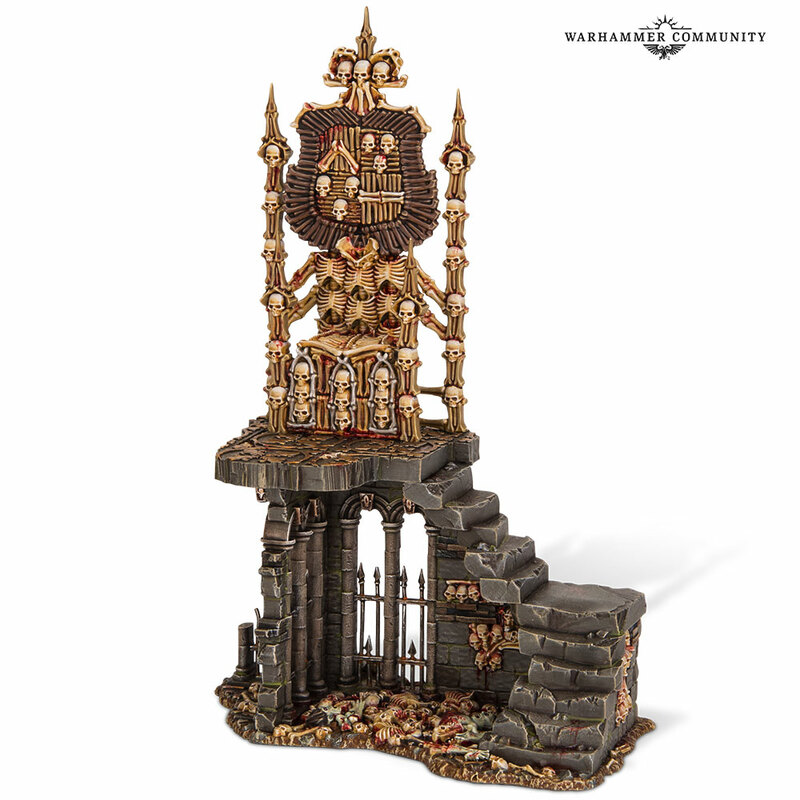 People have been sitting Nagash on the Magewraith Throne, so I'm expecting lots of people putting him on the bone throne too. Using those undead horses to pull a cart of some kind, that's a great idea. Maybe have them tilted forwards, you could have them as ethereal creatures passing through a wall or a tomb or something to cover the non-existant legs? Well within your formidable skills, I'm sure!